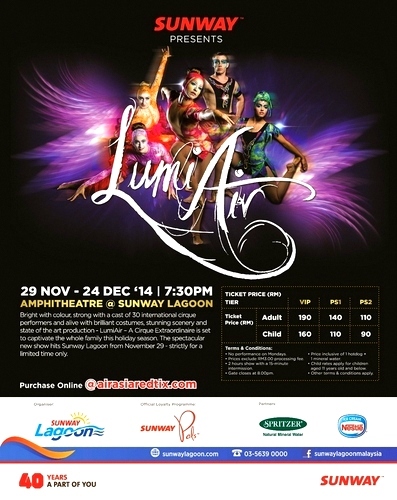 A first in Malaysia, Sunway Group is proud to present LumiAir – A Cirque Sensation debuting at Sunway Lagoon! All the way from Australia, LumiAir is a one-of –a-kind world class production featuring grand cirque style performance with breath-taking acrobatic ballet scenes and spectacular tricks filled with magical illusions and lightings effects. In conjunction with Sunway Group’s 40 Anniversary, LumiAir is a great way to end the wonderful year for the group at our very own Malaysian theme-park. To date, the show is already a big hit as the first eight shows have already been sold out. LumiAir runs every Tuesday to Sunday from now to 24 December at 7.30pm at the Sunway Lagoon Amphitheatre with a stunning cast of 30 international cirque performers from all over the world. The cirque sensation is brought to live in an illusion of colour and vibrant energy through its cast complemented with stunning costumes, lustrous scenery and state-of-the-art production. It is truly a magnificent and thrilling experience for audiences from all ages throughout the two-hour performances. LumiAir-A Cirque Sensation is produced by Susan Porett, who carries her 30 years of experience in various live shows and theatre entertainment. Together with her team which includes World Aerobics Champion Anthony Ikin and dance sensation Daniella Winter and her amazing production and technical team, Susan is proud to showcase a colourful cirque story of self-discovery, love and light through LumiAir. I was really excited to be able to attend the gala premier of LumiAir recently. Despite the rain and traffic, it was still a really exciting evening to be able to be part of the first few in Malaysia to catch a sneak preview of the spectacular LumiAir. The evening took off with our emcees from Red FM and Capital FM radio DJs getting everyone into the mood for an extraordinary evening. This was following by welcome speeches from honorary VIPs from the Sunway Group and Ministry of Tourism and Culture Malaysia. LumiAir gala premiere took off with Diamond, a beautiful innocent young girl who is trapped in the bleak desolate world of Darkness. It is throughout the story of her dream to escaping to a new life of freedom from the Arc Angel, Ruler of the Dark, where she discovers LumiAir, a world filled with colour, light, magical illusions, intriguging characters and a handsome prince. This is her journey of self-discovery as she learns amazing lessons and skills from all her encounters. The voice, keeper of knowledge and guide during Diamond’s journey. Three beautiful sisters who are expert in all things romantic teach Diamond about sensuality and femininity through elegant movement and inner beautfy. She teaches Diamond that anything is possible in LumiAir, soaring to the skies and above the clouds with grace and beauty. The strength and agility from the loyal protectors of the Prince of LumiAir is simply mesmerizing! Diamond meets her Prince of LumiAir for the first time! The ruler of LumiAir is loved by all for his fairness and kind heart. He is burdened with the task of controlling and mastering The Wheel, a dangerous machine that provides the power to LumiAir. Catch him in his thrilling performances that will surely have your heart skipping a few beats!